Its facilities, distinctive architecture, green spaces and environmental standing create a new generation of eco-district. 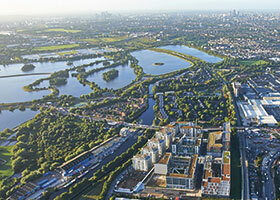 Described as somewhere that “could be the envy of any major European city”, Hale Village has become a desirable new area for London and a catalyst for the regeneration of Tottenham. There are over 1200 private and rental homes including a large amount of affordable housing. Apartments vary from 1 to 4 bedrooms, many with spectacular views of the city, the Olympic Park and the Lee Valley waterways and wetlands. Roof gardens, open spaces and a cosmopolitan streetscape enrich the living experience. Hale Village is next to Tottenham Hale station, on the Stansted Airport-Liverpool Street Rail line and Victoria Line tube. 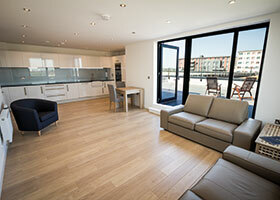 It is also just minutes’ walk from an area of natural beauty, waterways, paths and locks. 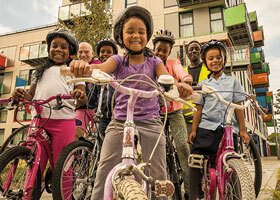 The mixed-use nature of the scheme and involvement of many partners create an active village community for residents and over 400 workers plus access to a Tesco convenience store, a state of the art gym, GP surgery, community centre and children’s nursery. 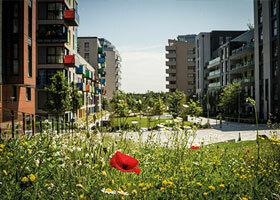 Hale Village is one of the most sustainable developments in London, providing green roofs, wildlife corridors and generous green open spaces. Apartments are Code 4 for Sustainable Homes and have the BREEAM Standard of Excellence. The whole development is powered by a £5 million energy centre, fuelled by recycled woodchip, cutting greenhouse gas emissions by 54%.